SUF delivers the first ASIST (Applied Suicide Prevention Skills) Training in Suffolk as part of our commitment to suicide prevention in the County. Worry less, achieve more, love what you do! SUF is planning new happiness cafes for 2017 and are looking for volunteers to support us. We celebrate in pictures our AGM in October 2016, which focused on ways we can support Suffolk Lives Matter. 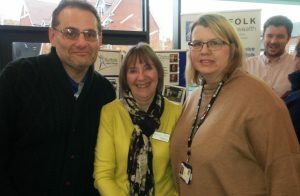 Wendy from SUF meets Jason Young, the new Local Area Coordinator for Beccles and Worlingham. Mental Health Supported Housing in Suffolk –An update on the SUF co-production events for the new Supported Housing Contracts from 1st April 2018. 2016 – An end of year round up through snapped chats! Joining together the puzzle of mental health strategic planning in Suffolk.